The Black-capped Chickadee, Parus atricpillus, is a lively little bird that is common to our backyards and can grow quite confiding. This bird was named the official State Bird of Maine and Massachusetts, USA. Black-Capped Chickadees average 5 1/4" in length. They have distinctive markings, including the black cap, a sooty black bib from the chin and throat to the lower sides of the cheeks and upper breast. The cheeks and the sides of the nape (back of the neck) are bright white while the breast, belly, and flanks are usually buff. The outer tail feathers are broadly edged with white. The bill, legs, and feet are black. These Chickadees breed across Canada and in the northern half of the United States. They make their homes in mixed and deciduous woods, willow groves, thickets and shade trees. They can also be found in suburbs provided nest sites are readily available. Chickadees will use a hole in a tree or cavity left by another bird as a nest site. The pair excavates the nest, using a natural cavity or sometimes an old woodpecker nest. 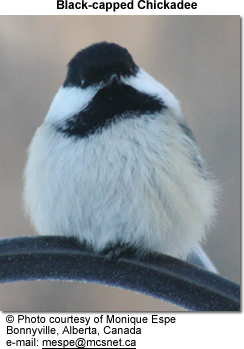 Chickadees will line these cavities with moss or animal fur, creating a soft spot to lay and hatch their eggs. Hens lay 6-8 eggs that are white with fine, reddish dots. Incubation lasts 12-13 days, and fledglings are ready to leave the nest after about 16 days. Black-Capped Chickadees raise one brood per season. You can provide an "artificial" cavity by adding a chickadee nest box to your backyard. 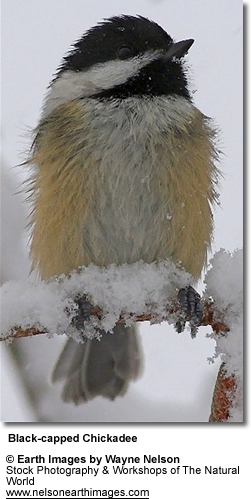 They may interbreed with Carolina Chickadees or Mountain Chickadees where their ranges overlap. The Black-capped and Carolina chicadees are virtually impossible to tell apart visually, but they are readily distinguished by call. Their point of overlap is near New Brunswick, New Jersey. Black-Capped Chickadees are closely related to the Carolina Chickadee. Their ranges often overlap and these two species may cross-breed. Because of that, it can be difficult to separate them. The most obvious difference between them is their songs. Black-Caps sing a two-note song and have a slower, lower-pitched call. Carolinas sing a four-note song. Hybrids tend to sing three notes. Black-Caps are also slightly larger and have more white edging in the wing. The distinctive "chick-a-dee-dee" call of the Black-Capped Chickadee is one of the most complex vocalizations found in nature. Researchers have noted that with slight phrasing variations the call can convey several different messages. Their calls may serve as contact or sentinel (alarm) calls. Thirteen distinct types of vocalizations have been classified. The song of the Black-capped is a simple, clear whistle of two notes, identical in rhythm, the first roughly a whole-step below the second. This is distinguished from the Carolina chickadee's four-note call fee-bee fee-bay; the lower notes are nearly identical but the higher fee notes are omitted, making the Black-capped song like "bee bay". The males only sing the song when in relative isolation from other chickadees. In late summer, some young birds will sing only a single note. Both sexes sometimes make a faint version of the song, and this appears to be used when feeding young. The most familiar call is the familiar chick-a-dee-dee-dee which gave this bird its name. This call has been observed to consist of up to four distinct units which can be arranged in different patterns to communicate information about threats from predators and coordination of group movement. Recent study of the call shows that the number of dees indicates the level of threat from nearby predators. An analysis of over 5,000 alarm calls from chickadees, it was found that alarm calls by triggered small, dangerous raptors had a shorter interval between "chick" and "dee" and tended to have extra "dees", usually averaging four instead of two. In one case, a warning call about a pygmy owl, a prime threat to chickadees, contained 23 dees. The Carolina Chickadee makes a similar call which is faster and higher-pitched. There are a number of other calls and sounds that these Chickadees make, such as a gargle noise which is usually used by males to indicate a threat of attacking another male, often when feeding. This noise is among the most complex of the calls, containing 2-9 of 14 distinct notes in one population that was studied.